"Prosperity Personal Checks" product is already in your cart. With an African style motif these Prosperity Personal Checks create a distinctive look that will get attention. In a variety of three colors of sage green, cocoa brown and rose red with each framed with a corresponding colored border each check features the statement “Prosperity is my birthright” to celebrate good health and well being for all and will be a welcome way to show your positive attitude towards life. 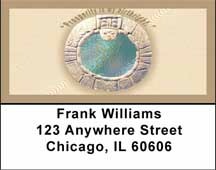 These attractive Prosperity Personal Checks provide a lovely way to pay your bills and still feel that you are making a difference and the attractive design sends a strong message.